This PDF 1.4 document has been generated by Adobe InDesign CC 2014 (Macintosh) / 3-Heights(TM) PDF Optimization Shell 4.8.25.2 (http://www.pdf-tools.com), and has been sent on pdf-archive.com on 25/03/2018 at 13:33, from IP address 223.231.x.x. The current document download page has been viewed 112 times. File size: 2.9 MB (240 pages). Mr. Peña turned $820 into a $400 million market-valued energy company in just 8 years! 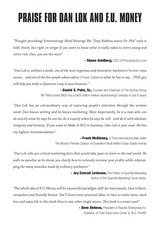 Author of the“Guerrilla Marketing” book series. - Dave Debeau, President of Results Enterprises Inc.
United States of America copyright law. Published by Elevate, Charleston, South Carolina. Member of Advantage Media Group. publisher is not engaged in rendering legal, accounting, or other professional services. P.O. Box 272, Charleston, SC 29402 or call 1.866.775.1696.
you damn well please / Dan The Man Lok. 1. Money--Psychological aspects. 2. Wealth--Psychological aspects. 3. Success. This file has been shared by a user of PDF Archive. Document ID: 00749068.